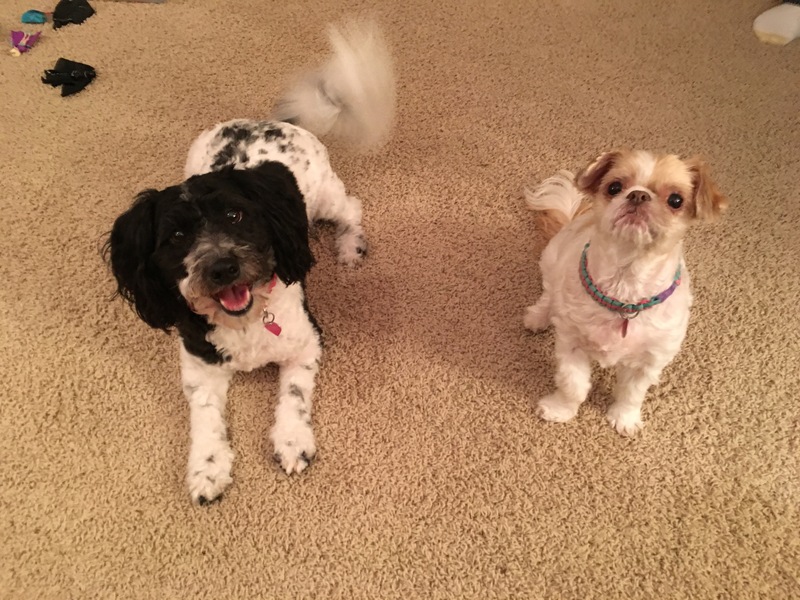 Sadie (left) is a three-year-old Bischon/Havanese mix who lives with an older dog named Izzy. Sadie’s guardians called me for help with a potential case of Separation Anxiety, potty issues and anxious behavior when guests arrive or around Izzy. It didn’t take long to see that Sadie was a high energy dog. We sat down in the living room to discuss what their guardians wanted to get out of the session, but it quickly became clear that Sadie’s excitement and anxiety needed to be dealt with first. I tried employ a few different calming techniques to try to distract Sadie and get her to relax, but in the end I had to turn to the old-fashioned consequence of placing her on the leash. I employ this technique when a dog has been repeatedly defiant or if their energy and excitement level are too high for the dog to listen. I also used this opportunity to go over some nonverbal ways to disagree with unwanted behaviors and anxiety. Another strategy that I strongly suggested that the guardians employ was what I call Petting with a Purpose. This involves not providing the dog with any attention or affection unless it does something for the guardian to earn it first. By asking the dog to sit, come or laid down on command we are placing them in a more subordinate body position. This helps the dog to start to self identify as being in a follower position. This technique also helps reinforce a healthy leader follower a dynamic. Essentially this translates to the guardians telling the dog, “I am only going to pet or reward you for obedience.” If everyone in the family employees this Petting with a Purpose technique for a week or two it will become second nature to them and something that they do from then on without even thinking. Because Sadie was still showing signs of anxiety, I had left her on the leash and continued to stand on it to prevent her from moving towards her guardian. When a dog is insecure it often will glob onto its guardian in an attempt to feel more secure. For limited instances this is fine, but if a dog employees this technique continuously over time it can lead to separation anxiety. My goal was to disagree with Sadie’s anxiety while also helping her develop a new way of behaving; remaining calm while she also was several feet away from her primary guardian. Now that we had achieved a calm and balanced state of mind for Sadie, I wanted her guardians to practice using the escalating consequences to define their personal space. It’s going to take some time and a concerted effort by all of the members of the family, but if they consistently disagree with Sadie each time that she gets to close without an invitation, the dog will learn to keep a respectful distance while also feeling confident. Now that I had gone over the tools and methods that Sadie’s guardians can use to disagree with her unwanted behaviors, I wanted to show them how they can practice using them in a real world situation. I had the family’s father leave through the garage and wait a few minutes outside before pretending to be an arriving visitor knocking at the front door. Sadie’s bark certainly had a territorial ring to it. While I wouldn’t classify it as aggression, she was moving in that direction. But because we are addressing it before it actually turned to aggression, it will be much easier for her guardians to stop it from happening. After showing Sadie’s guardians how I claimed the doorway, I had the father go outside and repeat the process so that I could coach the mother through the exercise herself. Claiming the door this way is one of my favorite exercises to teach because dogs usually pick up on it so quickly. I suggested that the members of the family call or text one another when they are on the way home and park their cars on the street so that they can practice playing the part of an arriving guest. It should only take 6 to 12 practices at this exercise before Sadie and Izzy both learn to stay behind the boundary whenever they hear a knock at the door. One of the last issues we tackled was Sadie’s negative perception of her kennel. Like many guardians do, Sadie’s family generally only placed her inside the kennel when they were leaving the home. Over time this conditions the dog to look at the kennel as meaning the humans are about to leave her behind. To dogs, one of the worst punishments is to be excluded from the group. So the lack of practice of being inside the kennel while the guardians were home had resulted in the dog no longer looking at the kennel as a good thing. I like to solve this problem by placing the dog inside the kennel and leaving the door open. Usually I stand in front of the kennel doorway using my shins to block the dog from exiting, but because Sadie is a smaller dog and her guardians had a plastic kennel, we had to add a tennis racket variation of this exercise. By leaving the kennel door open and gradually moving away from the entrance and small increasing steps, the dog’s guardians can help her learn to restrain herself. Over time the dog will be able to stay calm while inside the kennel for longer and longer periods of time. Because the guardians can only practice this exercise while they are inside the home, this will help the dog learn to relax while inside the kennel as she is no longer being left behind. Once her guardians have achieved keeping the dog in the kennel with the door open for 15 minutes while she is completely calm, it will be ready for the next step; closing the door. When the guardians practice the closed door part of the technique, they will also need to remain home and in sight of the dog while it remains in the kennel. This way Sadie learns to remain relaxed in the kennel while the door is actually closed as she can see she is not alone. By gradually increasing the time we ask the dog to stay inside, they become accustomed to it. One Sadie is able to remain in the kennel this way, her negative reaction to it should be gone completely. I offered a few additional tips and suggestions such as leaving treats or toys inside the kennel with the door open so that each time the dog goes inside, there is a reward. While Sadie did not have a full-blown case of separation anxiety, she was most assuredly on the path to it. By Petting her with a Purpose, instituting clear rules, boundaries and limits and disagreeing with the dog whenever it violates the new structure, her guardians will help the dog learn to remain in a calm and balanced frame of mind all the time.